For Commentary, The National University of Singapore Society (NUSS). Volume 23, 2014. IF ONE DOES NOT go back too far, one could divide relations between Singapore and Malaysia into the Mahathir period and the Post-Mahathir period. Malaysia’s long-term Prime Minister Tun Dr Mahathir Mohamed retired on 30 October 2003, after 22 years at the helm. Those years did witness quite a bit of tension between the two countries. To be fair, bad bilateral relations were already there before him. Even before Tun Dr Mahathir took over the country’s top post, things had been troublesome between the two countries. Even Singapore’s founding father, Mr Lee Kuan Yew mentioned in his book From Third World to First: The Singapore Story (p.289) that more was achieved in bilateral relations during the Mahathir era than under the three prime ministers before that. That says a lot about how difficult ties between the two have been. Be that as it may, in the decade following Tun Dr Mahathir’s retirement, Malaysia has had two new prime ministers — Tun Abdullah Badawi (2003 to 2009) and Datuk Seri Najib Tun Razak (2009 to present)—during whose tenures bilateral ties have been encouragingly warm. This apparent shift in foreign relations is all the more interesting as compared to how Tun Dr Mahathir had resolutely managed after his retirement to exert exceedingly strong influence over domestic politics in Malaysia. However, it would be too much to hope that the bad times between Malaysia and Singapore are over for good or to imagine that the material, notional and cultural reasons souring relations for 40 years prior to 2003 are no longer relevant. In fact, just recently in November 2013, news that Singapore had been part of the conglomerate of nations spying on countries in the region reignited international tensions — calls were quickly made for Singapore to apologise to Malaysia. Such incidents can be expected to arise even in the future to sour relations temporarily. The fact that memories tend to be long on both sides in relation to troubles with each other has not helped matters. To be sure, many concrete issues have been solved over the years. These include the Malayan Railway land cutting through Singapore (solved recently under Datuk Seri Najib Abdul Razak’s tenure); disagreements over water supply to Singapore (unravelled by technological advancements in Singapore); conflicting claims over the small island of Pedra Branca (resolved by the International Court of Justice); and CPF payments to Malaysians who had been working in Singapore (dissolved through agreement and by the ageing of claimants). Although tension continues over issues such as the use of airspace by the Singapore Air Force and so on, the stronger signal being heard, if one manages to ignore the ubiquitous political din, is an encouraging one. Collaboration between the two countries on matters of security has practically always shown impressive results. This has included cases such as piracy control; the capture of Mas Selamat; and the arrest of the Singapore “Messiah” hacker in November 2013. Where economics is concerned, ties have always been stronger than politicians have been publicly willing to admit as well. Labour flows from Malaysia to Singapore have consistentlybeen heavy and continue to grow daily. We also saw how, immediately after Tun Dr Mahathir Mohamed’s retirement in late 2003, Malaysia initiated the Iskandar project in Johor. Taking advantage of an effluent neighbour’s overflow of capital, an overflow of consumer demand and the overflowing need for land simply makes good economic sense. The question that begs to be asked instead is: why did it take so long for the Iskandar project to be conceived and implemented? 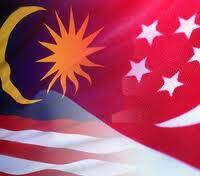 What is it that makes bilateral relations so inherently difficult between Singapore and Malaysia? Certainly, there is a complex culture of political sniping between the two developed over time perhaps with a conscious intention to keep both apart for the purpose of building national identity. Or is there something more inherently problematic in the two countries’ relationship to each other which is based on something fundamental such as competition over resources and trade? As with all relationships, ties between Singapore and Malaysia also go through different periods. Singapore in 1832, was used as an administrative centre for British influence in the region after inheriting the role from Penang. During the Japanese occupation of the region, the little island at the southern tip of the Malay peninsula continued to be the administrative centre. With the return of the British in 1945 and the implementation of the Malayan Union the following year, we saw how the British sought to retain Singapore even as they prepared to withdraw from the region. It was a jewel in the crown they preferred to keep. However, to locals, be they Malayans or Singaporeans, that division was unnatural. The political, and cultural, imperative to unite the two, was therefore felt to be very strong. Although finally accomplished in 1963 to suit all the powers that be, the going proved to be tough from the very beginning. The importance of Singapore as the regional centre for commerce, politics and education, as well as the metropolitan centre for Chinese immigrants in Southeast Asia, did not allow it to fit comfortably into the federation. In fact, it fitted so badly that a separation within two years seemed the only way to avoid serious inter-ethnic clashes from breaking out. Looking back, it would seem that the parts were brought together into a whole too tightly and quickly for the project to be viable. How optimistic the merger now seems, or was there not also a large dose of desperation involved with the British rushing to leave while the leftist threat was still strong in the region? The years following Singapore’s separation from the Federation have therefore to be seen in that light. On the one hand, Malaysia’s connection to the global economy and to important modernising dynamics was downsized. Singapore on the other hand, was detached from its natural hinterland and had to construct an independent polity that could not only grow fast but also defend itself with sufficient credibility. Making use of every advantage it had, without letting nationalistic or anti-colonial sentiments dictate economic policy over time, became Singapore’s greatest challenge. Against the nature of its own people, the new country had to create an identity and a pattern of behaviour that differentiated it from its neighbours, in fact, from its own history. Through its foreign policy, export-orientation economic strategy and its strong links to external players, it sought global connections in order to remedy its abruptly shrunken regional context. Malaysia’s issue with Singapore, on the other hand, stemmed more from being historically and ethnically offended by the separation than from any desperate need to manage on its own. Malaysia was big enough and rich enough to grow by itself. While more pragmatic Malaysian leaders such as then Deputy Prime Minister Tun Dr Ismail Abdul Rahman (in office from 1970to 1973) realised the advantage of learning from the hyperactive Singapore’s fervent search for solutions, others preferred to distance themselves from all things Singaporean, at least polemically. Tun Dr Ismail visited Singapore to study institutions such as the Housing Development Board and the Economic Development Board, something that his colleagues avoided doing for decades to come. In fact, under Tun Dr Mahathir, the basic stance was one of competition instead of complementarity. This was certainly worsened—and prolonged—by the mutual dislike that he and Mr Lee Kuan Yew had for each other. However, those days are now over, for all practical purposes. As can be seen in how important the success of the Iskandar project is to both the Johor government and the Federal leadership, the two countries have realised the gains that can come from two of the most developed countries in Southeast Asia working together and from both building on the complementary aspects of each their economies. Spiteful competition between the two only advantaged third parties, both near and far. From now on, ASEAN Regionalism is an important context within which the future of bilateral relations between Singapore and Malaysia should be analysed. There is no doubt that the changing political, strategic and economic structure in the East and South Asia region will introduce considerations that we are only just beginning to become conscious of. Regional integration at a deeper level may not be possible for a long time yet, but the development of contacts and connections at the people-to-people level, not to mention between businesses, is bound to alter profoundly the national discourses within the region. For one thing, ethnocentric agendas will lose traction once the benefits of intra-regional trade, travel and cultural ties have become obvious to governments and peoples. National ethnic minorities, placed in a regional context, are not easily defined and manipulated. Dealing with them will require more diplomacy and tolerance than has been the case when done within national frameworks. The uncomfortable nation-state structure that the various ethnic groups in Southeast Asia has had to live with since independence, once broadened by regional realities may help improve relations between them. In the case of Malaysia and Singapore, the inter-ethnic dimension has always loomed large. Tensions had been convoluted by inter-state relations which after all, follow a logic quite different from how groups relate to each other. The regional context holds great promise for dissolving mistrust and misunderstandings, not only where ties between Malaysia and Singapore are concerned, but in Southeast Asia as a whole as well. Infrastructural connectivity is bound to enhance a culture of political, economic and cultural openness towards regional neighbours. These neighbours are indeed quite different from each other in many cases. Some are only discovering each other for the first time. Policies such as the Open Skies for commercial flights have allowed Southeast Asians to visit each other’s cities and eat each other’s foods. Continued tension between Malaysia and Singapore would not only be unwise, it would also nullify the advantages that the two can have at a time when balances of power are shifting in the region. In conclusion, it should be said that from the very start, the assumption of Singapore and Malaysia being twins, or at least cousins, raised expectations of good relations to an unrealistic level. Complementarity requires more a focus on differences between the participants than on similarities. As states, the two are bound to disagree with each other on specific issues. That has to be accepted. However, beyond that, much improvement is possible, especially if we keep an optimistic eye on economic integration in the region. Singapore – Malaysia relationship as I see it realistically,should not be burdened or haunted by the past.On the contrary, it should assume a relationship that underscores the fact that both Asean neighbours are independent sovereign nations on their own right. I sometimes think that there is far too much sentimental attachment that undermines Singapore -Malaysia ties and it is imperative that it is done away with.We can forgo our past historical links by simply adopting a policy of disengagement.Singapore, I feel, has already done it with the announcement that Malaysians visiting the Republic will henceforth have to use international passports instead of previously restricted ones.This in itself reveals Singapore’s resolve in ” foreignising” its hitherto once close relationship to its Malay neighbour up north. Malaysia, on the other hand, has since ceased publishing Singapore TV programmes in its mainstream Chinese, Malay and Indian newspapers to signal its intent of eliminating the somewhat tiresome old historical baggage with its southern Asean neighbour. So, the inevitable question uppermost in the minds of Aseanians ( coined new word for citizens of Asean! ) is whether Singapore – Malaysia relationship is literally at the crossroads and need to be redefined. If the once close nexus necessitates redefining to propel it to a foreign one, would Singapore and Malaysia engineer a relationship basically based on the framework of regional cooperation and coexistence? If Asean solidarity is perceived to be a viable convenient tool, is it conceivable that a win-win situation is in store for both countries?